n 1905, Vic Cartwright's England rugby team lined up against Dave Gallaher's touring All Blacks at Crystal Palace - the first ever meeting of two national teams. Ensuing matches, in both the amateur and professional eras, have been dramatic and controversial, steeped in the historical rivalry of the... read more traditional home of the game for the nation that has claimed rugby as its own. Men in white (such as Wakefield, Beaumont, Carling, Leonard and Johnson) versus men in black (Meads, Lochore, Fitzpatrick, Lomu, McCaw). Hakas drowned out by rousing renditions of 'Swing Low, Sweet Chariot'. Grinding forward tussles on cold, murky afternoons and sweeping back-line movements on sun-lit grounds. 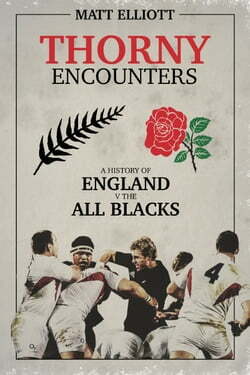 Thorny Encounters chronicles the first 40 Test matches between England and New Zealand, in which giants of the sport have measured themselves against each other. In the professional era, the match has become the clash of the hemispheres.